Our first stop on our LEGO NINJAGO Movie Celebration was the LEGO Master Builder Presentation. 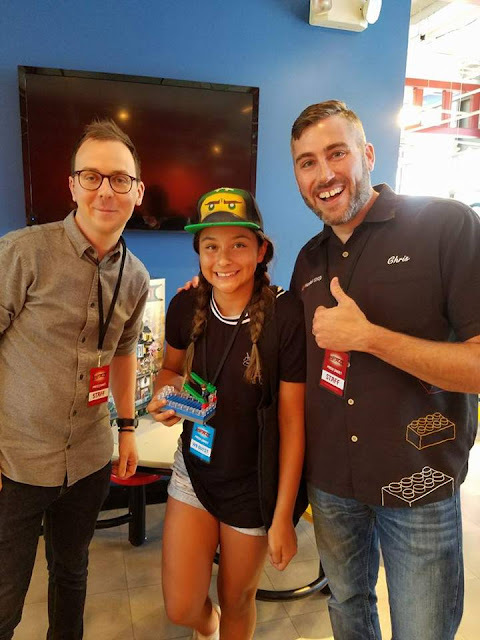 I can not express how honored I felt when we were told that Chris (1 of 8 Master Builders) and Simon (set designer from Denmark) were going to help our kids create their own mini additions to the NINJAGO sets already started! It was really amazing to see how creativity can flourish when you let it run wild and free. 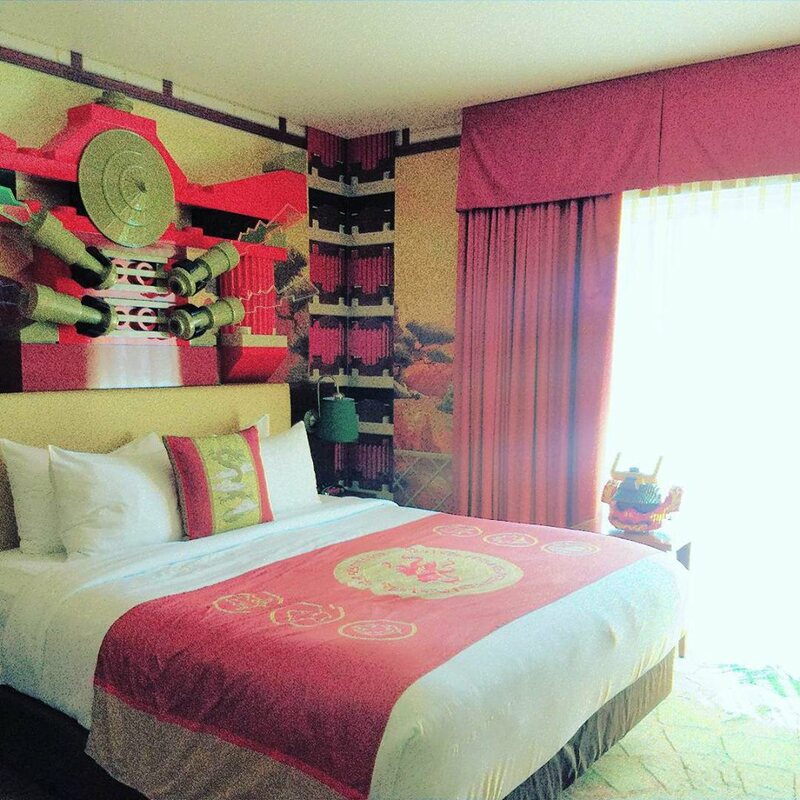 Thank you gents for the once in a lifetime opportunity to see all things LEGO NINJAGO the way you dream it up. Second stop... NINJAGO Ride! This is probably my son's favorite ride at LEGOLAND CA. 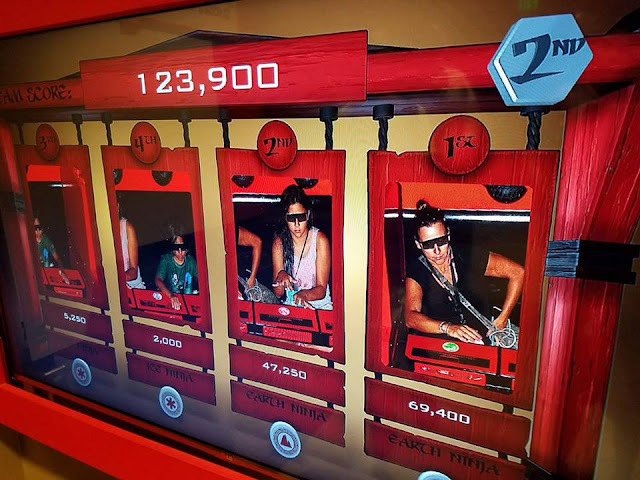 We rode it 3 times and took a few moments to check out all the new LEGO NINJAGO product like that is available. 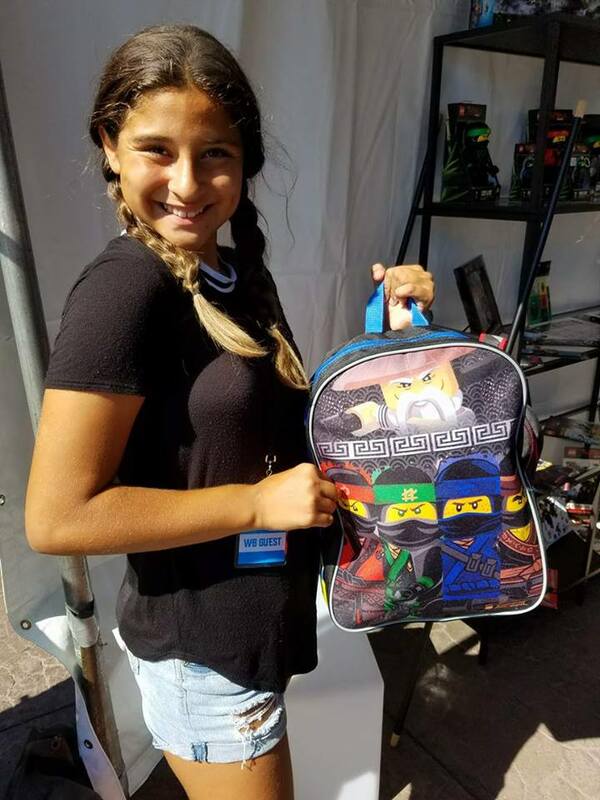 My daughter found the perfect backpack for her brother. 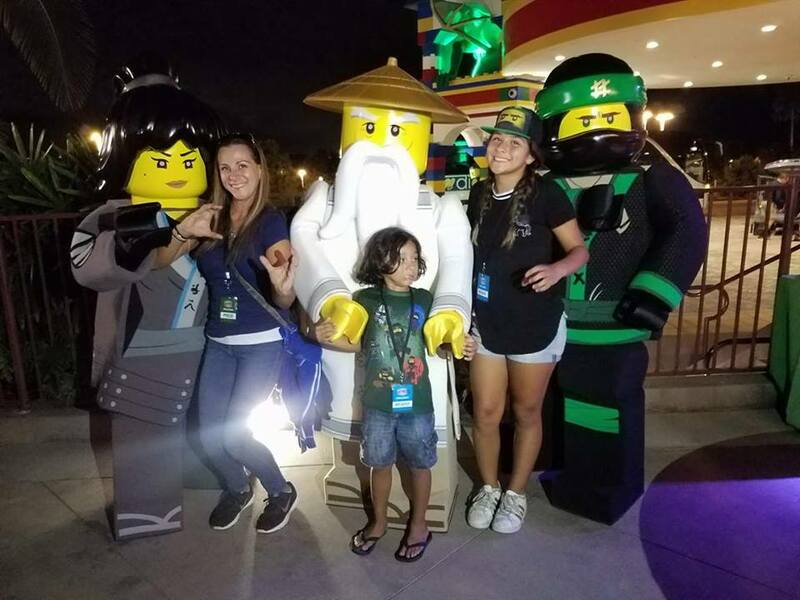 My kiddos were so excited to see the movie they wanted to go back to the room and change into their LEGO NINJAGO goodies in prep on the evening fun. Take 3... our 3rd stop was a memorable one for me. We boarded busses and took a group trip to the movie theater. My son sat with his new friend and they chatted the whole way. My daughter hung with her little friend that she loves to act like a big sister to and we arrived at the theater ready to get our LEGO NINJAGO Movie night on. Treated with popcorn, soda and our seats we were all very eager to experience seeing the Ninja's go! Aside from me telling you that I LOVED the movie... there are few movies that are just "that good" that they keep my son's attention the entire time. It can be tough with Autism and sensory as well as sitting and attending for long periods of time. HE ROCKED IT LIKE A NINJA! The entire movie he sat attentively, laughed, looked at me and hugged me a few times and told me he loved it so so much. 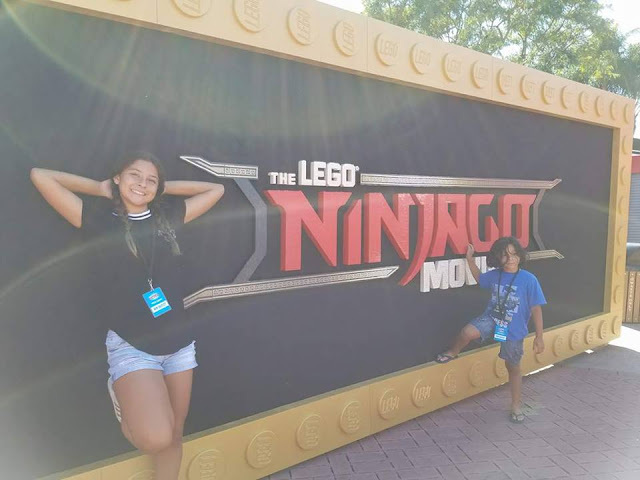 I am going to recap the movie itself in a moment but first let me tell you what we took away from the LEGO NINJAGO Movie. 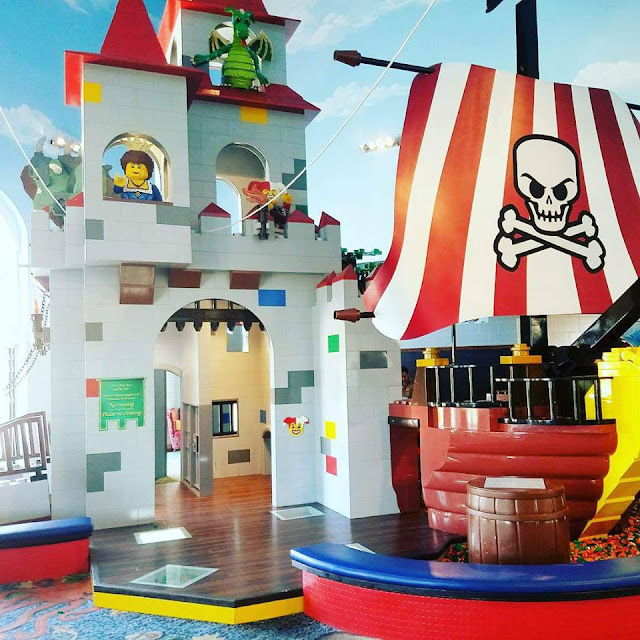 We all loved it and the kids really thought it was bricktastic. I am very impressed with how well it showed and it kept my five year old son who is on the autism spectrum completely engaged the whole time. My 10 year old who is neurotypical said she can't wait to see it again and take dad since he was not able to come down with us. I was really touched with the emotional connection between friends, family, being different and how different is unique, special and can bring great things. This is something we talked about in our family all the time so thank you for including that in such a great movie. I was inspired by the LEGO NINJAGO Movie to share the meaning to me and how it touched my heart with others too. 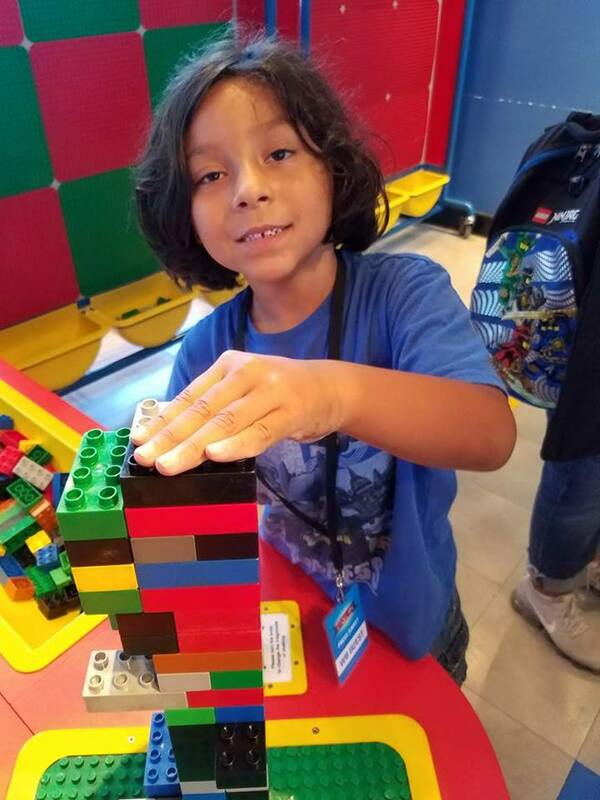 The next day back at school I took 14 pieces of random sized and shaped Legos to my son's SAI Basic special needs kinder/1st/2nd grade class... the teacher and I talked about the new LEGO NINJAGO Movie and how my son sat through it all. I gave her the run down of the movie and how I felt it did a great job of showing everyone is different but as a team you can do awesome things. 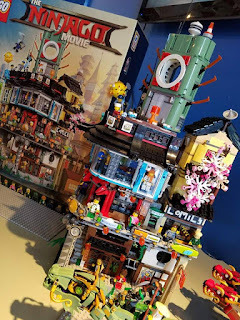 She had the kids pick a piece, all unique and different, all special and so cool in their own way... but... then they built a tower together and saw how all the pieces together made a strong bricktastic tower. That's pretty special to be able to show firsthand to the kids. Thank you LEGO NINJAGO Movie for that. After the movie we hung out meeting others and with friends chatting while the kids played by the moonlight. There was La-Loyd, Master Wu and Nya were ready to take photos with us all. The photo booth was super fun and we all had to get our LEGO NINJA pose on. That was such a fantastic full day of LEGO fun all over the place. 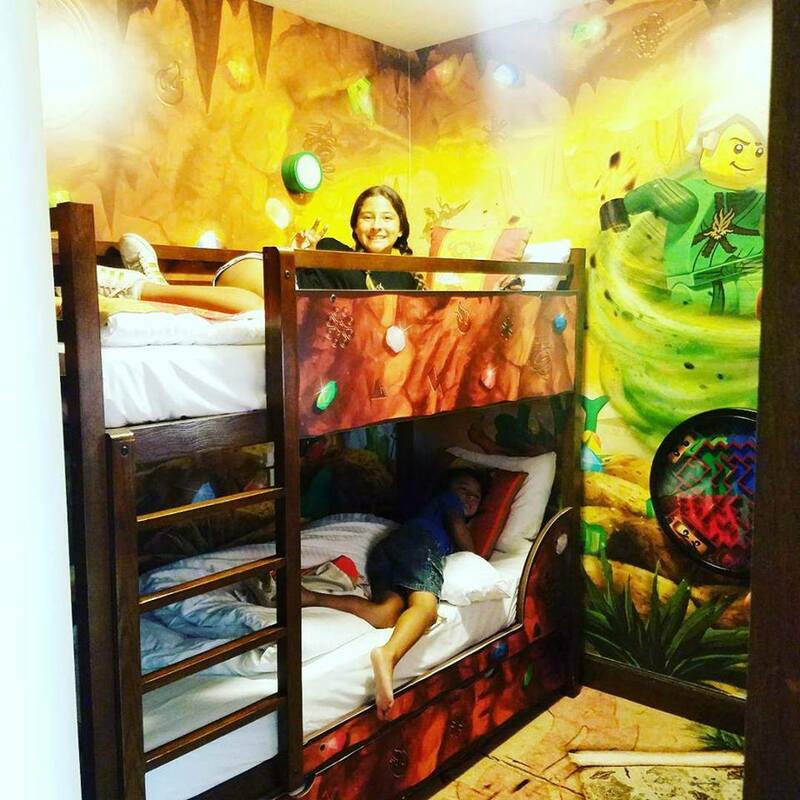 We had an awesome restful sleep in our LEGO NINJAGO Themed room. I am not sure who had more fun in the room.. the kids or me! 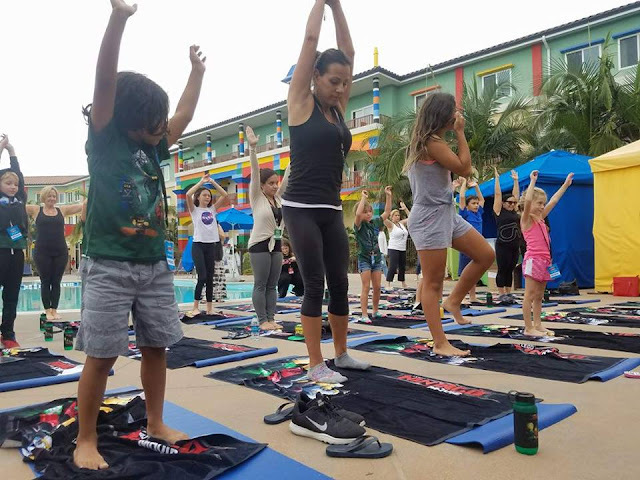 Early bird catches the worm... or Ninja Spirit... we got ready for Ninjoga bright and early pool-side. Refreshing and fun we loved the Ninjoga (Ninja-Yoga) as we all took in deep breaths and talked about what the LEGO NINJAGO Movie meant to us all with the patience and kindness with in us. It was a huge honor to attend the Movie Junket - the Interviews with the entire cast, production and development team was an experience we will never forget. 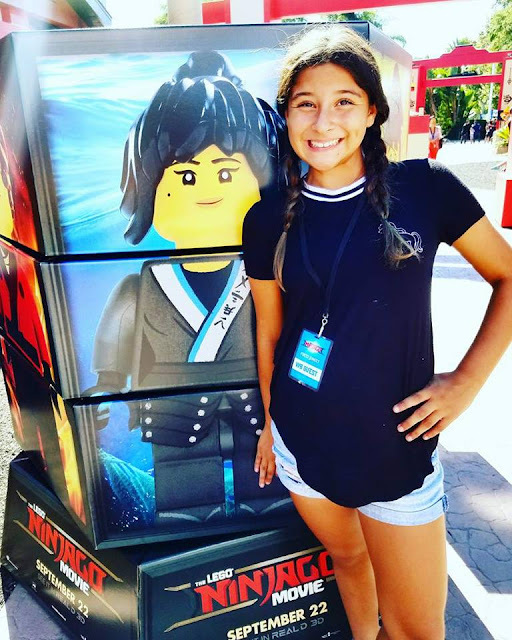 The passion behind each and everyone involved really shows through in their emotions when speaking about their roles in the LEGO NINJAGO Movie. 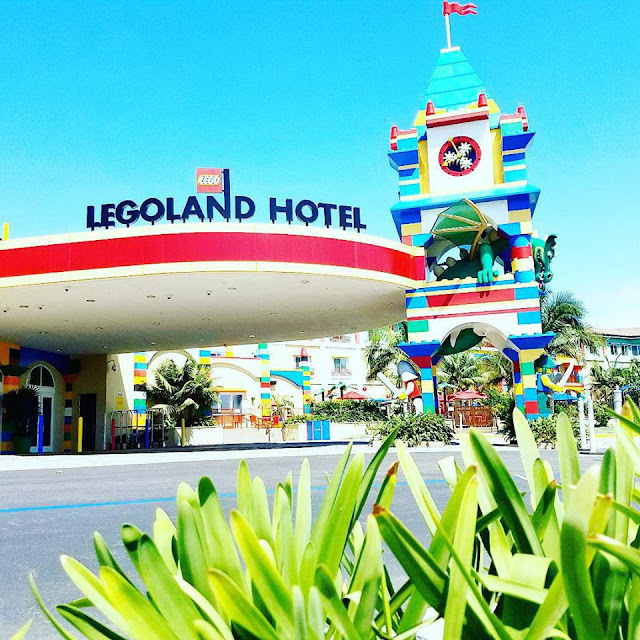 We spent a few hours poolside and inside LEGOLAND and my kids did not want to leave.. no seriously they asked to just check in and stay for a while!?!? Thanks LEGO NINJAGO Movie for the unforgettable time together. 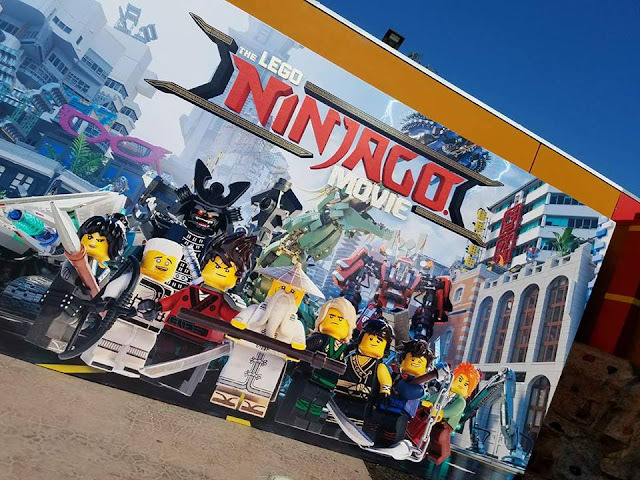 We can not wait to see LEGO NINJAGO Movie again asap. Lets get to the Movie and some fun facts we learned at the junket... with out ruining it for anyone we suggest you watch the two available trailers as well. We got hooked and watched the trailers about 40 times in excitement prep of the movie itself! Led by Master Wu, as wise-cracking as he is wise, they must defeat evil warlord Garmadon, The Worst Guy Ever, who also happens to be Lloyd’s dad. 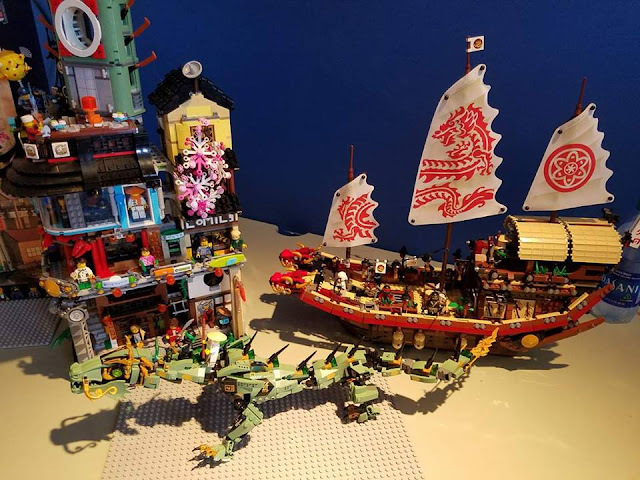 Pitting mech against mech and father against son, the epic showdown will test this fierce but undisciplined team of modern-day ninjas who must learn to check their egos and pull together to unleash their inner power of Spinjitzu." There's a feline surprise with Meowthra... she's so cute we wanted to take her home. 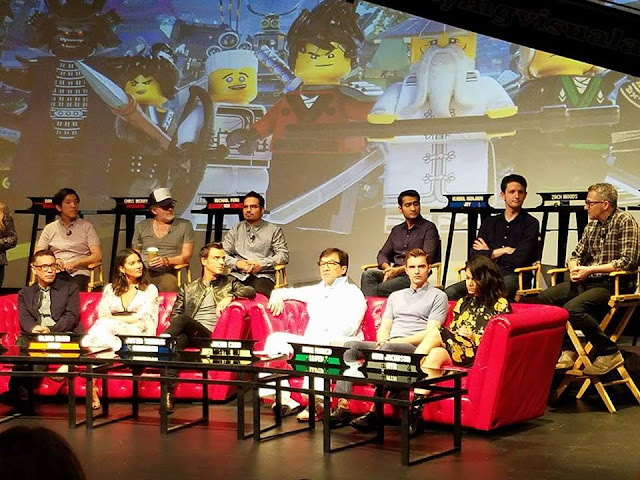 The LEGO NINJAGO Movie took about 4 years to put together and connected filmmakers, animators, designers and cast working together from Los Angeles, Sydney and Denmark! 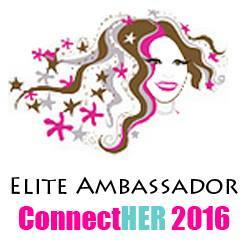 I wanted to share some of the most fascinating facts I was so impressed to learn at the interviews with everyone. * Research and Development with Animal Logic is key. They care about how everything feels and looks to a T. They take everything they do to the next level. * Kim Taylor, one of the film's two production designers, said "this film is far more based on outdoor light, with real sky, real clouds and warm sunshine..." a more back to basics feel but giving the Minifigures perspective on the natural world. Loved how that showed in the movie. * A Monstrous Beast aka Meowthra can take down NINJAGO City with the swipe of her paw. I loved how this showed that nature can intermingle with the LEGO Bricks. Loved it. * Lloyd has Green eyes. Not a typical LEGO eye shade but added for the movie as a Hint as to who and what his true identity is. I think these extra little touches to detail are what makes the movie such a hit. 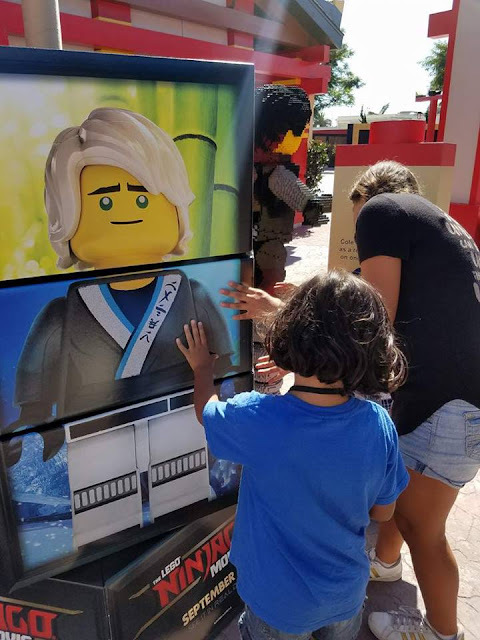 * NINJAGO Movie is populated with no fewer than 315 characters, 80 unique faces and 12000 possible combinations of features showing relatable emotion. Wow just wow! * The cast agreed that everyone wanted to have fun, surprise everyone with emotion, for people to feel joy, see humor and relate with a character. Well, we feel that all of that and more was accomplished, love the movie. * Zach Woods is Zane and in the interviews he was asked how he did his robotic voice for the character. I loved how honest he was with the reality that he just has a very stoic and robotic voice along with movements naturally. He said it wasn't hard since he is pretty robotic in his daily life. I LOVE THIS! Success and strengths come in all shapes and sizes as well as personalities and abilities. Love you for you Mr. Zach Woods. You hit home for us. 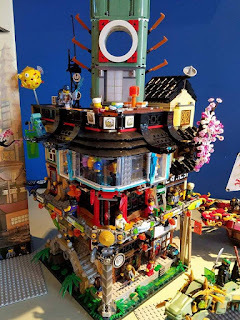 * Master Builders developed over 15 construction sets to go along with the new LEGO NINJAGO Movie. We just got a set yesterday and have it built half way... we also have a Meowthra named KeeKee and she loves to tear Bricks down too! * The cast was fun , delightful and really did bring their own personalities to their character. They each talked about what the character they play means to them. Jackie Chan is such an animated passionate actor. My kids were so impressed with how each played their role so fiercely but with obvious fun supporting the character. As each actor/actress is different, each Ninja is too. 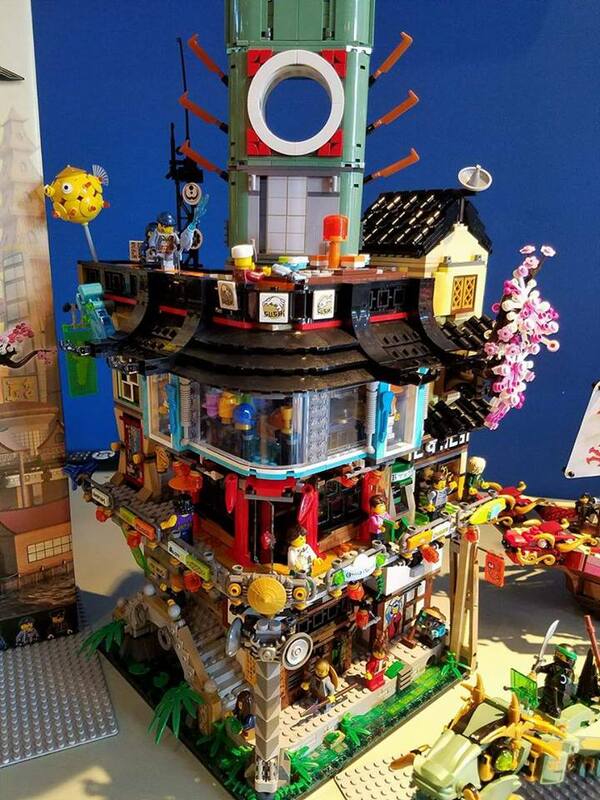 This is what makes each Ninja real and significant on their own but stronger as a team of NINJAGO Ninjas! With only a few days to wait until Lego Ninjago Movie hits theaters be sure to check out the two trailers we've been watching daily for weeks! 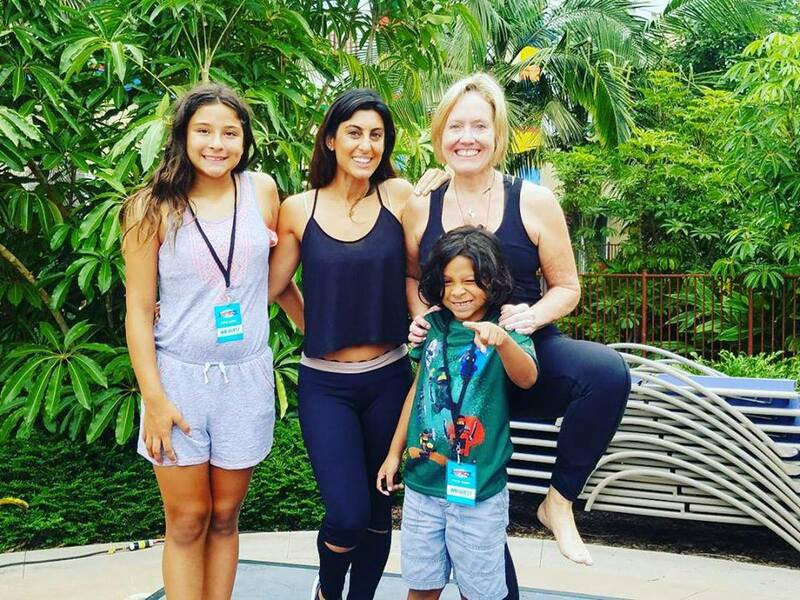 We are all hooked on mastering our Spinjitzu and seeing the film again this weekend! 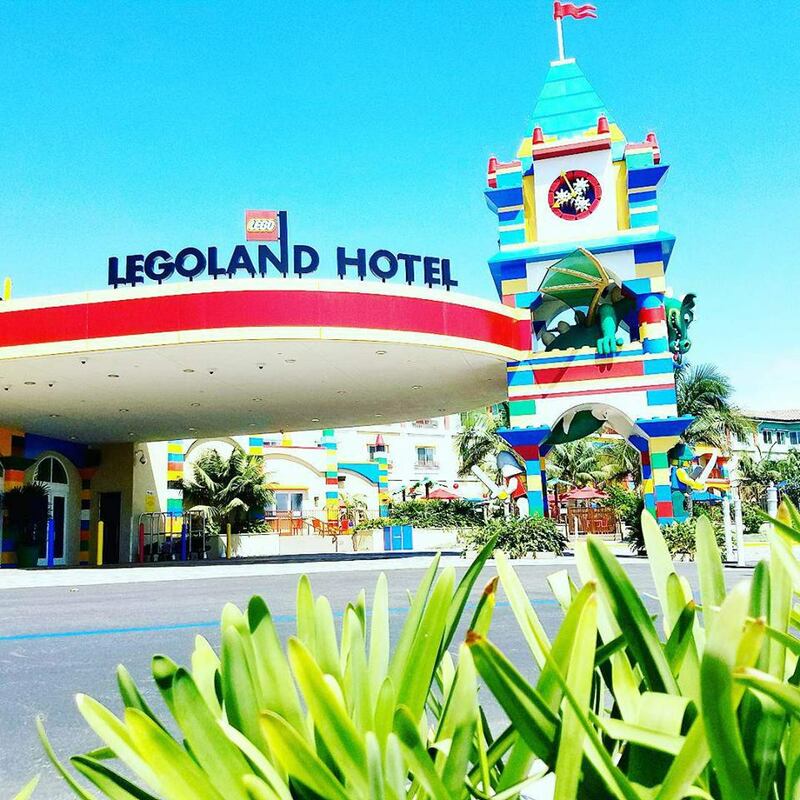 We may be headed to the Drive In Theater for round 2 of LEGO NINJAGO Movie & this weekend is also LEGO NINJAGO Days at LEGOLAND CA!